Getting an entire community involved in fundraising events is one of the best ways maximise donations and spread publicity. Schools, businesses, social clubs and individuals can all become involved in a community fundraiser. Fundraising is an ideal way to bring a community together through a common goal. Everyone can become involved in a community fundraising event and the more people involved the more funds should be raised. It’s not hard to come up with community fundraising events and themes to bring the community into the fundraiser. The more people involved the easier it will be to spread publicity, and this is an inexpensive way of advertising the fundraiser. Community members will be more likely to donate if the funds are being raised for a local good cause. A plus point with community fundraisers is that a section of the community can be involved in choosing the events. Fundraiser organisers can take a poll from the community on the type of events that would be the most popular. This is a good way to get community members involved and bring in some new event ideas. People are also more likely to attend a fundraising event that they have contributed to and been involved with from the start. Social networking sites can be used to take opinions and ideas on the fundraiser. There are always plenty of community causes that can benefit from fundraising events. Local children’s homes, schools, individual medical aid and cleaning up local beauty spots are just a few of the many good causes. Where the funds are to be allocated should be decided at the planning stage, and involving members of the community will be a good idea. Community fundraisers are also a good way to obtain free publicity from local radio stations and newspapers. Again, opinions and ideas on the fundraising cause can be taken through social networking sites and the fundraising website. Community fundraising events are an excellent way to maximise donations and get a diversity of people involved. Local businesses, national businesses, churches, schools, social clubs and even local government offices can all become involved. Local businesses can be contacted regarding sponsorship deals, financial donations and product donations. Local businesses involvement also means that employees can become involved, and this is a case of the business benefiting from publicity through sponsorship. Getting local businesses involved should also mean inexpensive publicity for the fundraiser by placing poster and flyers in business premises. 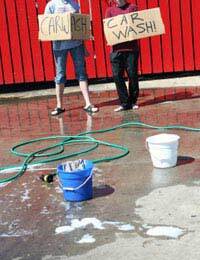 Advertising a community fundraising event can be achieved at very little cost. The internet is of course free to use and fundraising websites and social networking sites will cost little or nothing. The major benefit of social networking sites is the amount of people who can be contacted in very little time. Free publicity can also be obtained through local radio and local newspapers by agreeing to an interview on the fundraising cause. If local businesses are involved it may be possible to persuade them to print up flyers and posters for free. Getting the whole community involved in a fundraising event is a sure fire way to swell the number of attendees. Word of mouth is one of the best forms of publicity and costs absolutely nothing. It only takes one successful fundraising event to make a real difference within a community.